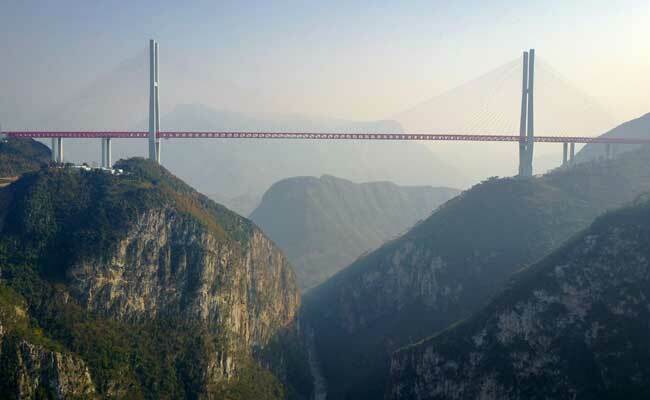 World's highest bridge, Beipanjiang bridge, opens in China with 144 million cost. The Beipanjiang bridge in southern China has opened to traffic following three years of construction. Built above the Beipangjiang valley in Guizhou province, the bridge boasts a 1,341-metre span. 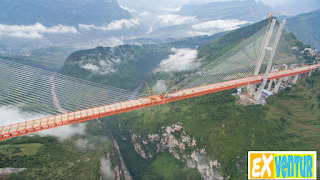 It soars 565 metres (1,854 feet) above a river and connects the two mountainous provinces of Yunnan and Guizhou, the Guizhou provincial transport department said in a statement on its official website. The bridge cut travel times between Xuanwei in Yunnan to Shuicheng in Guizhou from more than four hours to around one, a truck driver surnamed Duan was quoted by the official news agency Xinhua as saying after the bridge opened Thursday. It was "very convenient for people who want to travel between these two places", he added. The 1,341-metre span cost over 1 billion yuan ($144 million) to build, according to local newspaper Guizhou Daily. 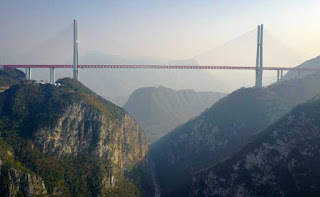 It overtook the Si Du River Bridge in the central province of Hubei to become the world's highest bridge, a separate statement by the provincial transport department said earlier.